Lauren LaPorta was just 11 years old when she slipped and fell into her family's pool, leaving her with a spinal injury and the prospect that she may never walk again. But now, the 28-year-old guidance counselor from Bergenfield, New Jersey, has achieved what once seemed impossible: Walking up stairs, working out three times a week and dropping 40 pounds in just five months. "It's amazing to see something like this right before your eyes," her trainer, Erica Little, told InsideEdition.com. "By the grace of God, she's doing so well." LaPorta was in middle school when she fell into the pool and shattered her C5 vertebrae. "When I went to go hit the bottom, my hands gave way and I hit the ground," she recalled. "I remember everything just went numb at that point." She was left wheelchair-bound and uncertain of her recovery. She began a grueling physical therapy regimen and after a year, she was able to move her feet again. But she remained confined to a wheelchair and, thanks to a diet of Wendy's and McDonald's, she soon started piling on the pounds. "When you are limited physically and you're exhausted... you don't want to get out of your car and go into any place to eat," she explained. That's when Retro Fitness and Little, her trainer, came into her life. "We first met at Holy Name Hospital in Teaneck, New Jersey, and now we're like BFFs," LaPorta said. The two started training together last August in a first workout session LaPorta described as "brutal." "The first day I tried to use the treadmill, I fell," she said. "When I went home that day, I said to myself, 'I have to push through.'" And she did. Little has helped LaPorta gain enough strength to walk up and down the stairs at Retro Fitness. "The first time she walked with a cane she was wobbly and winded," Little recalled. "Now she's walking 300 to 400 feet with a cane and ace wrap... She'll try anything." LaPorta can't believe her progress, either. This week, she walked on the treadmill, performed squats and worked on her back and triceps. "Last week I got on the treadmill for five minutes and it went pretty fast so I was impressed with myself," she said. "Now, I actually look forward to going to the gym and working out." And her strength isn't all that's improved. Since training with Little, LaPorta has lost more than 40 pounds. She's also switched the McDonald's and Wendy's meals in favor of fruits and vegetables. Little said she's inspired by LaPorta's attitude. "I look at her and I don't see a wheelchair. I see her," she said. "I see someone who is dedicated, determined, and who will really go the extra mile for you." 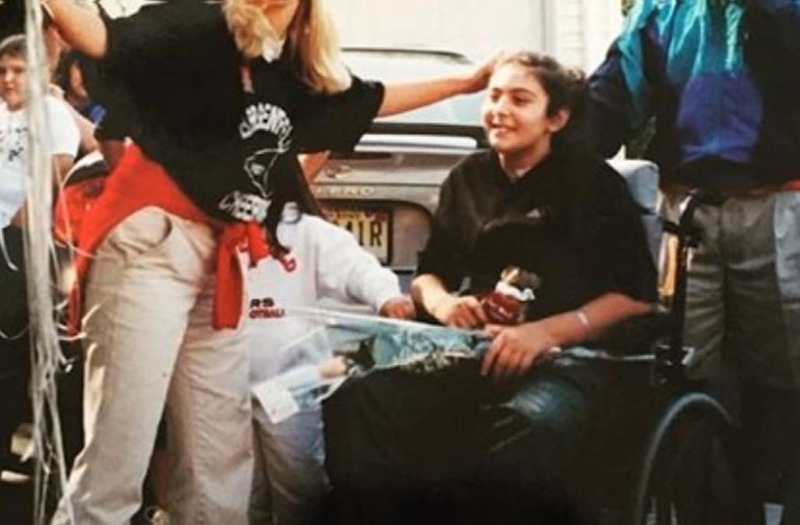 LaPorta hopes her story can inspire others with similar injuries to find the resources they need to get stronger, resources she wasn't aware of 17 years ago. "My personal goal is to walk with some assistance, like my cane, and not struggle so much," she said. "I want to feel strong enough that if I get up and walk right now, I'm not going to collapse and fall over." Little agreed that those with injuries similar to LaPorta's should not be afraid to go to the gym. "I just think that her success story should show other people that through dedication and determination you can turn your life around," she said.